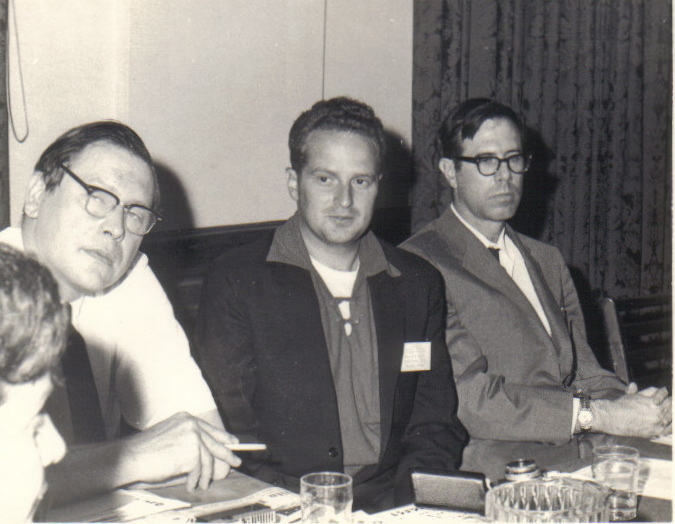 Taken at the what would become the National UFO Conference in 1965 in Cleveland, Ohio at a Holiday Inn. 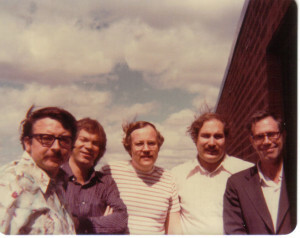 L to R: David Halperin, Dale Rettig, Jim Moseley and Michael Mann. Courtesy Rick Hilberg. 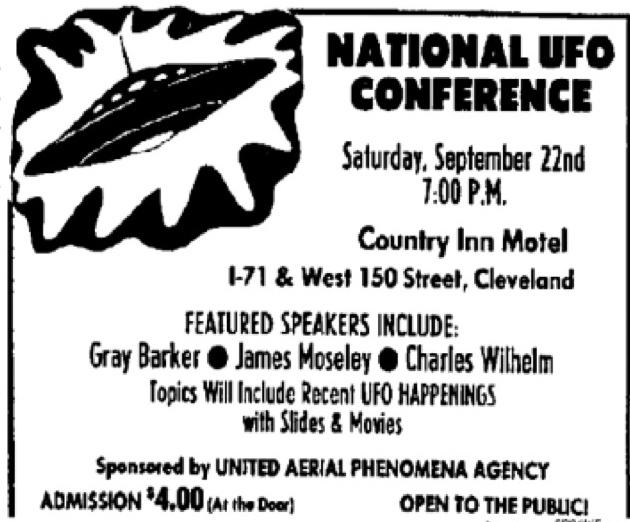 The National UFO Conference was organized in Cleveland, Ohio in the year 1964. 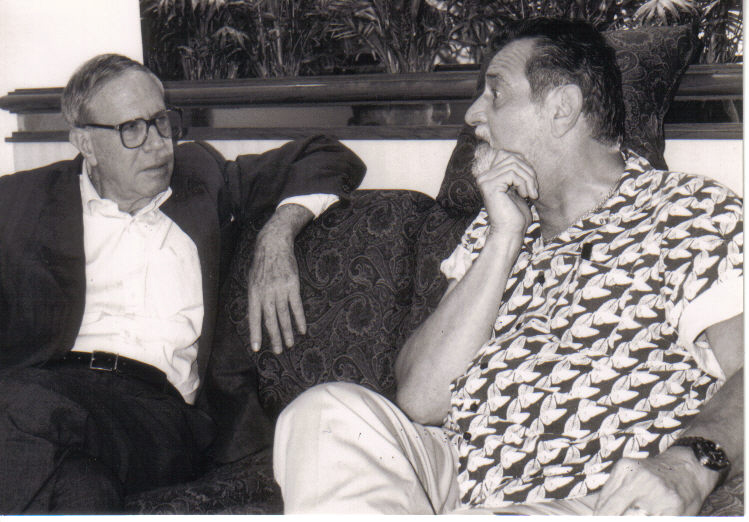 The co-founders were Rick Hilberg of Cleveland, who remains very active in Cleveland ufology; Al Greenfield of Atlanta, Ga., who now writes on more esoteric subjects; and Al Manak of Cleveland, who died recently. 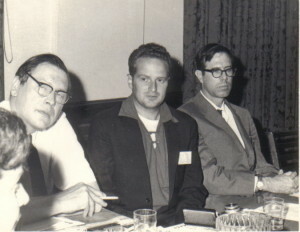 The 1965 Congress in Cleveland of L-R: Gray Barker, Mike Mann and Jim. 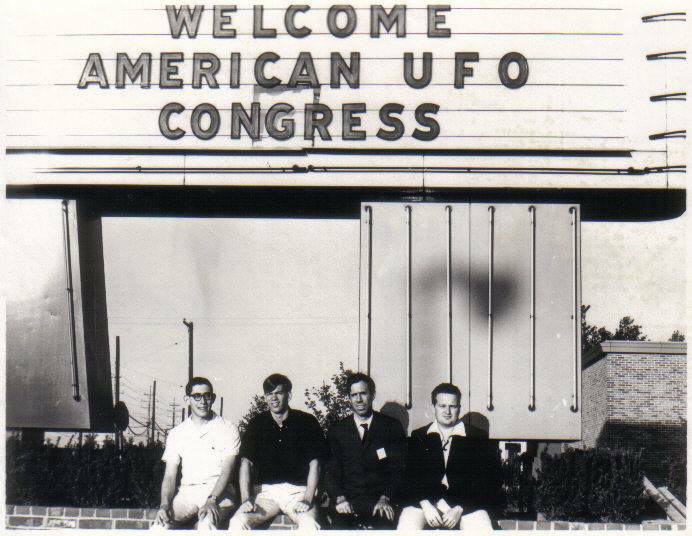 The original title of the organization was the Congress of Scientific Ufologists, but within a few years we realized that this was a pretentious title, and we therefore changed it to the present one. From the beginning, the main purpose of the NUFOC was to hold an annual meeting or convention. Outside speakers were booked for these conventions, but there were also smaller side meetings at which actual ufological research was done. From 1964 through 1970, Al Manak was the Permanent Chairman of the organization. There was also a small governing body which is still called the Permanent Organizing Committee (POC), the membership of which has changed from time to time over the years, to reflect whether or not its members maintained an active interest in the UFO subject. At present, the members of the Permanent Organizing Committee are: Jim Moseley; Rick Hilberg; Karl Pflock; William Moore; Al Greenfield; Antonio Huneeus, Curt Sutherly; Timothy Green Beckley; Tom Benson; Matt Graeber; and Tim Brigham. All of these people are well known in ufological circles for various important contributions they have made to the subject. In 1971, Jim Moseley became Permanent Chairman of the NUFOC, and remains so till the present time. He had been a speaker at all the previous conventions, but was not a founder of the organization. He has continued to be a speaker at every convention but one, over the intervening years up until the present. Moseley has also been on countless radio and television shows over the years, and was a speaker on the U.S. college lecture circuit from 1966 to 1974. 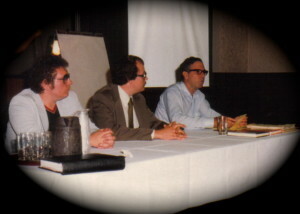 L to R: Cliff Stenberg, Dale Rettig, Rick Hilberg, Edward Biebel and Jim at the 1976 National UFO Conference in Cleveland, Ohio. Since the 1960s, the NUFOC has stopped doing actual UFO research on an organizational level, and is simply devoted to staging a convention somewhere in the United States each year. There is always a Local Chairman, who undertakes the financial risk and takes care of the many details involved with planning a convention. The Local Chairman does this with whatever degree of help and advice he chooses to accept from others, including but by no means limited to Moseley and the other members of the POC. This year’s Local Chairman is Miles Lewis, who will hold our 38th annual convention in Austin, Texas, on the weekend of September 14th-l6th -as explained elsewhere in more detail. Tim Beckley, Rick Hilberg and Jim Moseley. 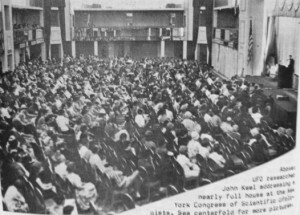 Over the years, the NUFOC has held its conventions in cities in all sections of the United States, including: Cleveland, Ohio; New York, N.Y.; Charleston, West Virginia; Atlanta, Georgia; San Francisco, Ca. ; Burbank, Ca. ; Tucson, Arizona; Phoenix, Arizona; Miami Beach, Florida; Tallahassee, Florida; Minneapolis, Mn. ; Bordontown (near Trenton), N.J.; San Antonio, Texas; and Corpus Christi, Texas. Many smaller cities, especially in Ohio, are also included in the long list. Some cities have hosted our conventions more than once. Most of these conventions have drawn about 150 to 400 paid attendees, but the one in New York City in 1967 was much larger. A total of about 8,000 people attended the four public sessions. This was probably the largest indoor UFO convention ever held. The enormous attendance was made possible by the fact that UFO sightings in the state of Michigan in 1966, usually called the (alleged) “marsh gas” sightings, caused a huge amount of interest nation-wide in the subject of UFOs. This peak of interest has not been seen since, with the exception of the focus on the 1997 50th anniversary celebration of the “Roswell Incident”, in Roswell, New Mexico. John Keel packing the house, 1967 NYC NUFOC. Most, but not all years since 1964, the NUFOC has given an award to some leading ufologist whom we consider to be outstanding. This has variously been called the Robert Loftin Meorial Award, the Ufologist of the Year Award, or the Lifetime Achievement Award. Recipients include: John Keel; Gray Barker; Rick Hilberg; Stanton Friedman; Dr. J. Allen Hynek; Timothy Green Beckley; Jenny Randles; Antonio Huneeus; Tom Benson; Dr. Frank Stranges; Jerome Clark; Karl Pflock; Whitley Strieber; and Walt Andrus, who is the recently retired International Director of MUFON. Jim lecturing at the 2002 NUFOC. The National UFO Conference welcomes all reasonable ufological views, though the members of the Permanent Organizing Committee tend to be relatively conservative in their outlok on the subject. 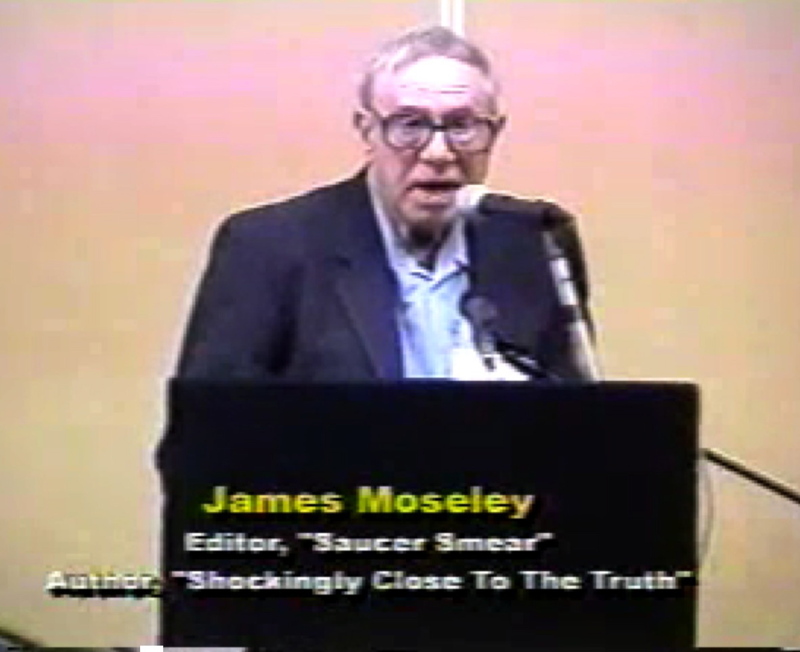 “Saucer Smear,” published since 1954 by Jim Moseley, is not an official publication of the NUFOC, and represents only his own relatively conservative views, laced with a strong dose of sarcastic humor. Jim omitted the name of one of the founders, namely Dale Rettig. Dale was a very active ufologist back in the early 1960s and ran an Illinois based UFO organization that had a very fine for the time, almost professional looking newsletter. Most ufozines of the time were either run on Ditto machines ( remember those purple pages? ) or maybe a mimeograph. Offset printed publications were quite scarce, although I did start doing my “original” UFO Magazine by offset as early as 1964. Anyway, Dale, Allen Greenfield and I were the principals in a group called the American UFO Committee back in 1963 ( It was group that combined three organizations that we each were the heads of into one fairly large national group. ), and it was at this time that Greenfield came up with the seminal idea of holding a serious, non contactee gathering in 1964 and seeing if it would take hold. As an aside, the idea of a serious gathering may have been the result of a conference call that I sponsored in late 1962 where I got some of the more active serious ufolk together to talk about more cooperation to streamline the gathering of data regarding the phenomenon. Greenfield has said on several occasions that this may indeed have been the case. Allan Manak was the chairman of a very active local Cleveland UFO group at the time and he came right on board with our idea and made his organization the the local host, and also made sure that we got lots of local publicity. Without his tireless work there probably would have been no annual gatherings of the CSU/NUFOC after 1964. And Al did serve as chair until late 1971, and not 1970 as Jim stated. Jim and Al Manak at the 1994 NUFOC gathering in Cleveland. NUFOC had a pretty good run, but from the beginning we really stressed the cooperation angle and although several joint projects were done over the years ,most of the participants still clung to their pet projects and individual organizations. It really took a monolithic group such as MUFON to come along several years later and hold annual meetings for its members to attain a consistent following and thereby prosper. Clarksburg, West Virginia, spring of 1960. © Joe Gonzales. Credit: Tom Benson (James W. Moseley archives). Moseley went on to say that the flying saucer had two large antennae on top. 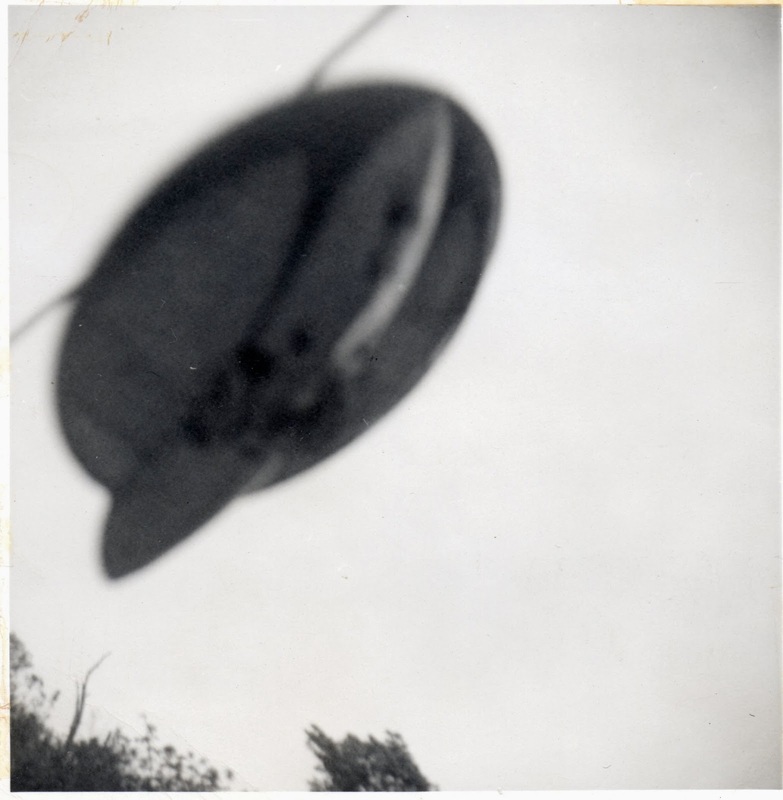 But as consultant Andrés Duarte has ascertained, this is nothing but the two extremes of a thread on which a model of flying saucer hangs (see following illustration). The young photographer explained the lack of confirming witnesses because he lived in a thinly-populated section of Clarksburg, and that one of his neighbors was asleep and the other was away. On 2012 James Moseley died and Tom Benson inherited his archives. Moseley used to file any picture reported in his newsletter with the corresponding journal issue. I requested Tom to mail to me the original print, which he immediately did. A cursory look at the picture gives the impression of a lousy trick. The object is more unfocused than the background tree tops, suggesting that it is a small size object located very near to the camera. But you do not need to be very wise to reach a conclusion like this. Moseley, who has been labelled as the “ultimate bull shitter”, wrote:one is tempted to wonder if the picture may not be of some more common object such a garbage lid with protrusions added. We cannot agree more. After examining the photograph, photographic expert Andrés Duarte pronounced: Indeed, the difference in focus reveals the proximity to the camera, but the absence of camera and lens data prevents quantitative evaluation of the defocusing. 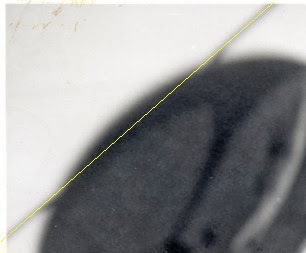 The rope or cable used is almost perfectly straight but it seems distorted near the edges of the object, this type of apparent deformation is due to the defocusing and is related to the “black drop effect”(1). Not two antennae but the visible part of the thread supporting a small model. © Andrés Duarte.